Milo attract kids with their latest on-pack promotion! Kids love free gifts. And, Milo knows to get through their major market, they’ll need interesting marketing gifts. Hence, the famous brand offers an on-pack promotion for kids. Milo is a chocolate and malt powder mix that is mixed with milk to create an instant milkshake. Nestlé manufactures Milo and is popular around the world. Nestlé uses a lot of on-pack promotions and in-pack offer in their global product ranges. 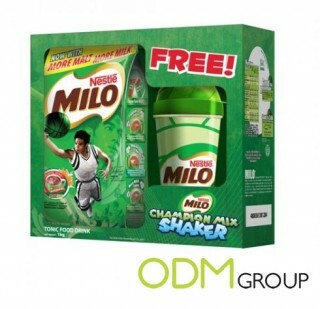 Milo offers a premium champion mix shaker as an on-pack promo. The chocolate drink brand targets children and parents alike with this promo gift. This awesome promotion is available all over Asia. Customers would simply purchase the on-pack gift which includes 1-kilo of Milo ready mix chocolate powder. Each pack contains a champion mix shaker that comes in 3 collectible designs. Milo based the designs on either basketball, volleyball or football. The shaker is made from non-toxic/ BPA free material hence it’s safe for usage. Also, it’s really portable making it the best partner to bring during games and sports events. When it comes to the design, it resembles like a trophy which is very encouraging for the kids. Moreover, it leaves a good impression on customers. Therefore, Milo is noted as a brand that supports skill and sports development which is really good. Having a gift that is complementary to the product makes the gift with purchase attractive. Practicality – The shake in the pack complements the product. 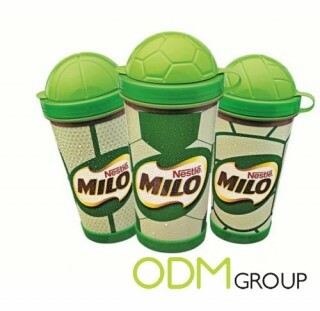 Everyone needs a shaker to make a Milo drink. This is very convenient when you’re always on the go. Added Value: Consumers knows what a good promotional item is. And, Milo’s shaker is definitely a good example. Hence, this encourages consumers to buy more. Boosting Sales: Offering a free gift allows the brand to be noticed more than its competitors. Consumers tend to compare products. Therefore, this exclusive promotional package helps seal the deal for the consumers. Furthermore, this comes in different designs so it becomes a collectible promo. All in all, the list of benefits are exhaustive for on-pack promotions. Practical promo gift is a cost-effective alternative to add value and boost sales. If this item interest you, feel free to contact us today! Here at ODM, we have a professional team of designers and manufacturers to meet your needs. Nestlé Shows Us How a Free Gift Promotion is Effectively Used!